of lengths to choose from as do the shelf brackets. Position the first upright where you want it. 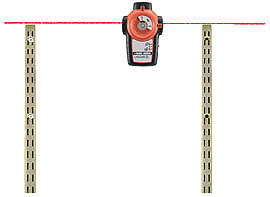 Make sure it's perfectly vertical with a spirit level. Then mark the screw holes with a pencil. Drill, plug and screw it to the wall. Mark where the second bracket goes BUT check with your laser level that the top is exactly level with the one you've already attached. Check also its vertical then mark the screw holes. Drill, plug, then screw it to the wall. 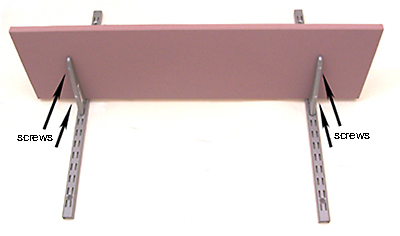 Simply slot the brackets into the uprights at whatever shelf height you want. Lay a shelf on top and secure with screws from underneath. N.B. be careful with the screw length. You need them to be just long enough so they don't come right through.